Some people may think that there’s nothing that says springtime in America quite like baseball and apple pie. Not us. Around here it’s freshly brewed beans and softball. 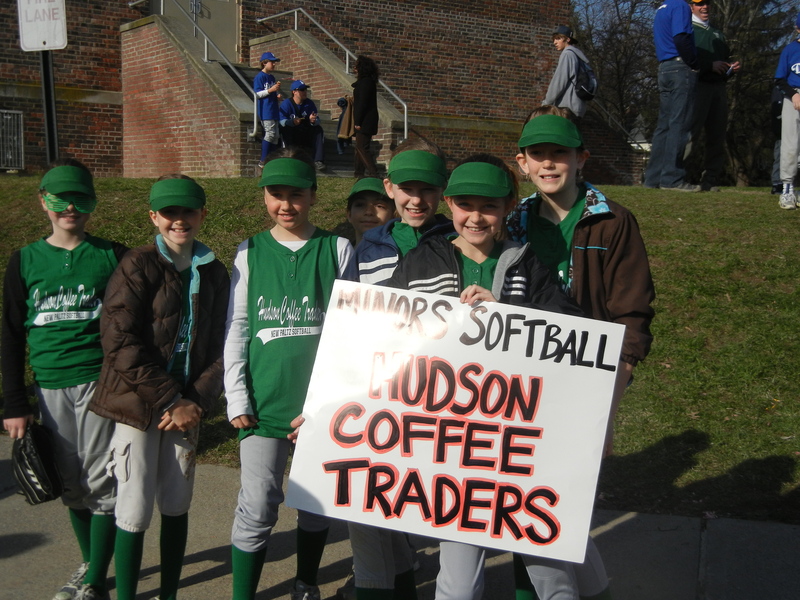 That’s why we are so exciting to be sponsoring ‘The Mighty Beans’ in the New Paltz Baseball and Softball Association. When our oldest daughter, Katie decided that she wanted to play in the “minor” league this year, it seemed to be such a natural fit for us to sponsor a team. We are so proud to be affiliated with the recreation program which has been the official softball and baseball program for New Paltz and Gardiner since 1995. Chartered through both Cal Ripken All-Stars and Babe Ruth, the association’s volunteers have tirelessly worked to improve the playing fields in the community, sponsor clinics during the off season and provide over 600 children from ages 5-15 with the opportunity to learn, play and enjoy the games of baseball and softball. Led by Coach Bob Hansen, The Mighty Beans (also known as the Traders) have begun the season with a bang; 4:0. The team, made up of 12 fourth & fifth grade girls, is a force to be reckoned with. But, keeping with the spirit of fair play and to encourage optimum playing time the league has a 4 runs or 3 outs rule. In other words, no team can score more than 4 runs in an inning- the association wants to make certain that everyone gets field time, a philosophy we think is great. Everyone is also encouraged to play as many positions as possible although our Katie is one of the few kids who wants to step behind the plate to play catcher so chances are that’s where you’ll find her for most of the season. This is no holds barred softball, so these kids are learning to hit, field, steal and slide! And yes, grass stains are just about as hard to get out of clothing as coffee stains are. So… if you’re in New Paltz stop by for a game. We may not have any coffee for you but we can promise you a good ball game. Next game, Wed 5/11 at 6pm, at Lenape Elementary School on Eugene Brown Drive in New Paltz. P.S: Congrats to @Sleepjunky the winner of our April blog drawing!!! She’s won a bag of Hudson Coffee Traders coffee of her choice. Jealous? Well, you just might be the winner this month if you leave a comment, link back to or re-tweet our blog. You’ll automatically be entered so comment, tweet, link, post away!